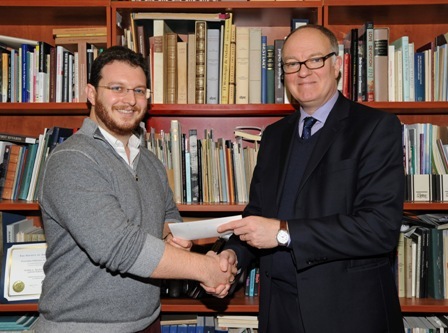 Micha Lazarus (St. John’s) was awarded the Gordon Duff Prize for his essay, ‘Chaekus habet: the circulation of Aristotle’s Poetics in sixteenth-century England’. Richard Ovenden, Deputy Librarian and Director of the Centre for the Study of the Book, presented Dr Lazarus with the prize on 17 January, 2013. Lazarus surveyed sixteenth- and early seventeenth-century English institutional library catalogues (including Thomas James’s catalogues of the Bodleian) and private booklists, to present an extensive list of owners of the Poetics in the period. One of these was Sir John Cheke, the first Regius Professor of Greek at Cambridge University and tutor to Edward VI; the inscription “Chaekus habet” in a manuscript booklist indicated his ownership of a volume containing the work. This detailed bibliographical study also casts light on the circulation and modernisation of Aristotelian collections in England. It emerged from Lazarus’s doctoral research, supervised by Professor Richard McCabe, on the subject ‘Aristotle’s Poetics in Renaissance England’. The Gordon Duff Prize is awarded for an unpublished essay on a subject relating to the science or arts of books and manuscripts. The competition is open to all members of the University. The next prize will be awarded in 2014.